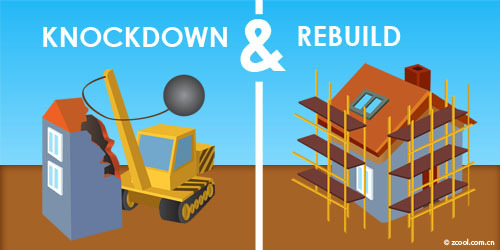 With a shortage of residential land within the inner suburbs of Brisbane and the cost of renovations compared to a new build the prospect of Knockdown and Rebuild Projects in Brisbane is increasingly popular offering exceptional value and lots of benefits. Building a new home enables you to start with a blank canvas unlike renovations, extensions and alterations…costly budget blowouts with unforeseen construction problems. With technology and innovation of the latest building materials available makes building a new home a lot smaller and more energy efficient allowing you to take advantage of today’s modern lifestyle. At OJ Pippin Homes we offer advice to help you to choose the best home design to suit your block, tastes and budget using a design from our extensive range or your own. Our entire process includes knocking down the old house, applying for all council permits and engaging services while building your new home on time to a fixed quoted price. Our One Stop Shop covers from concept to planning, construction through to completion as well as marketing or asset management. A member from our construction team will provide you with all the essential details and information before you start the process removing all hassles all allowing you to make an educated decision.